This blog post mainly displays ways to weaponise existing Angular sandbox escapes. Note that from Angular 1.6 and onwards, the Angular sandbox has been removed. This change made the framework code faster, smaller, and easier to maintain. The main reason behind the removal of this feature was the number of bypasses identified by security researchers. For the remainder of this post, we assume the attacker has already identified an XSS vulnerability and is attempting to further exploit this flaw for profit. This blog is for educational purposes only. Do not attempt any of the below exploits against systems you are not authorised to. Should the payload successfully evaluate, a “49” will be visible in place of the payload. For this example, we used ‘atob’ to base64 decode the payload on the fly, and eval to then execute it. 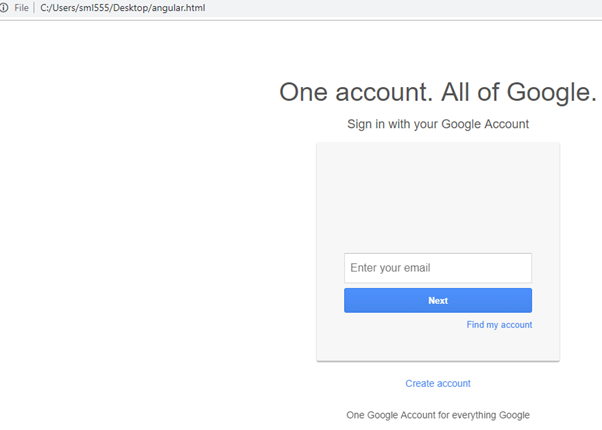 Our final task for this blog post is performing page redressing into a phishing page, using the Angular sandbox. Usually, depending on our clients, we try to redress the page to the email service they use (can usually be identified easily using Open Source Intelligence), or the login page of their own website. Since most modern pages require a significant amount of code to display aesthetically (few hundred kilobytes), our raw payload will be far too large. Instead we can use the sandbox escape to perform an AJAX request, which loads the code into a variable and then redresses the page. Since AngularJS no longer uses the sandbox in the latest versions of the framework (≥1.6), simply updating the version of Angular mitigates any kind of sandbox escapes. Please note that simply using a framework like AngularJS and using security headers do not protect you from Cross-Site Scripting (XSS) attacks! Always sanitise user input!